Learn more about our practice and read what our patients have to say about us! 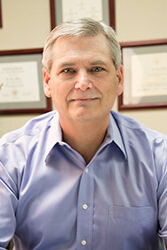 After graduating from Baylor College of Dentistry in 1981, Dr. Welch moved to the Texas Panhandle and established his dental practice in the community of Fritch. Throughout his years of practicing dentistry, Dr. Welch's desire has been to give individualized care with excellence to all of his patients. Because of his desire to bring world class dentistry to the Texas Panhandle, Dr. Welch has pursued advanced training throughout his career. After completing the entire continuum of training at The L. D. Pankey Institute for Advanced Continuing Education, Dr. Welch was asked to join the teaching faculty, which he was a part of for several years. He also obtained his Fellowship in The Academy of General Dentistry and continues to strive to remain on the cutting edge of modern dentistry. Dr. Welch and his wife Pam raised three daughters in the Fritch community. He enjoys spending time with his daughters and their families, the outdoors and fly fishing. He also serves as vice president of Crisis Aid International and works on their overseas projects several times a year. As a native of Fritch, Dr. Henderson is honored to have the opportunity to practice dentistry in the town that has always been home to him. Dr. Henderson is married to his high school sweetheart Kimberly, and they have four sons and a daughter; Kellen, Kole, Karson, Keegan, and Kyla. 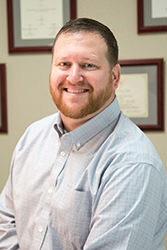 After graduating from Sanford-Fritch High School Dr. Henderson attended and played baseball at Frank Phillips Community College and Howard Payne University where he earned his Bachelor of Science degree. Dr. Henderson then completed his DDS degree from the University of Texas Health Science Center San Antonio; he also completed the Preceptorship in Dental Implantology and was chosen to participate in the Implant Surgical Selective that is limited to eight fourth year dental students. He also understands that furthering his education is essential to providing the best care to patients and has completed continuing education courses at the Dawson Academy, the Pankey Institute, and is an active member of a Spear Study Club in Amarillo. This is a test bio for a hypothetical staff member.